This post is way overdue. We have since made another trip to NYC which I wrote about here and more writing soon to follow. So most of you already know of our epic trip to NYC over Thanksgiving weekend (2013). Epic is a real stretch since we were traveling with Wizard, our beagle, who at the time was in need of spinal surgery. His hind legs, in particular, were numb from pinched nerves and displaced spinal discs. Poor Wizzy was not himself, but medicated. We met up with our son who came down from UMASS Amherst to spend the holiday weekend with us. As it turns out, S has many college buddies who are from NYC and nearby in NJ. He went to an Indie concert with his friends and helped babysit Wizard when Jonathan and I were off on our food wanderings. NYC doesn't get Seattle's coffee culture on, and at some point I wished that it did, but I still desire to live in NYC for countless reasons, not one. I would be stalking Russ and Daughters for anything smoked fish and Breads Bakery for savory and sweet pastries and muesli bread, weekly, if not more frequently, for starts. 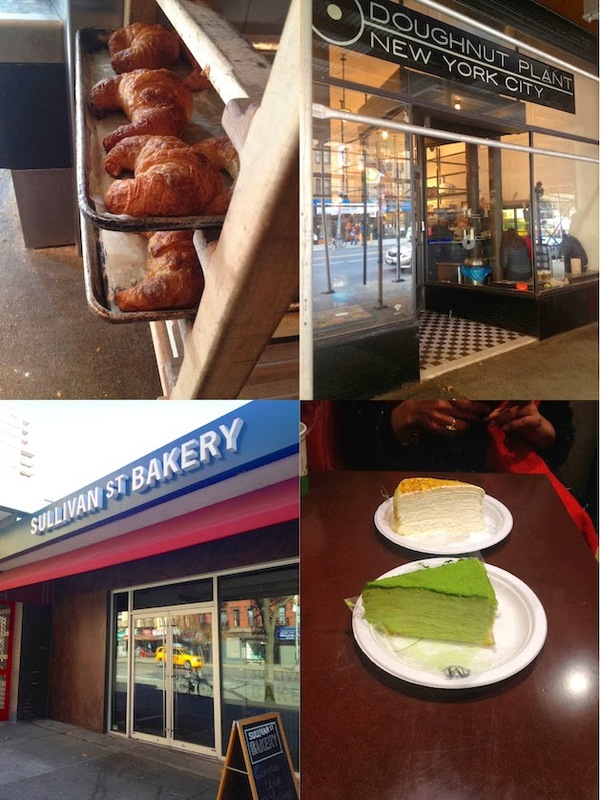 Speaking of coffee, our wanderings began with a run into the Sullivan Street Bakery in Chelsea for coffee and pastry. The owner and master baker, Jim Lahey, was at the bakery, huddling, at the end of the counter, in the back, engaged in a muffled conversation with his bakery/cafe manager. I introduced myself to the famed revolutionary no knead method inventor and witnessed first hand his hypercritical personality of all that his bakery puts out. Lahey's bread baking idiosyncrasies left me in awe. When I further read his introduction to his 'My Bread', upon my arrival back home days later, Lahey's intensity, uncompromising attention to detail and fidgetiness all the while multitasking, all made the more sense. It seems a juxtaposition of traits but a formula for a genius at the craft. The samples of the Pane, hot out of the oven, bread that were passed around to Sullivan Street Bakery's patrons, were probably one of the best, if not the best, bread I ever had in my lifetime. Jonathan can also attest to that. Super crusty, like I have never experienced before, with a deep chestnut hue and a 'webby' soft crumb. Mind you, also the best cup of cappuccino we had in NYC. Coffee and parking fees in NYC leave a metallic, unpleasant aftertaste. Not to make light of it, but I felt an urgency to see a neurologist. A conversation with a coffee afficionade waiter at Red Hen in DC recently confirmed that this ping of an acidic aftertaste is the most recent trend in coffee in New York City and elsewhere in the US. I dislike it, might as well be acid. 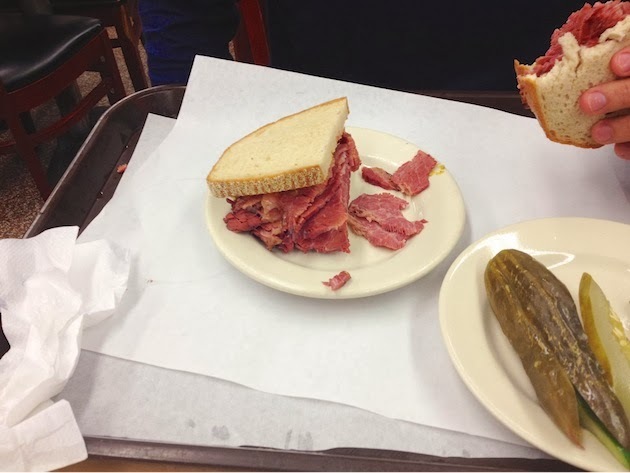 We had our NYC go to Ta'im's, on Waverly Place, green Falafel for lunch that day and Katz's Delicatessen's pastrami and rye that evening for Thanksgiving Thursday. The coleslaw in the pita at Ta'im's is a sweeter rendition on our preferred, slightly lemony, traditional version. You can request to leave it out. Pastrami and rye for Thanksgiving?! I am a stickler for tradition when I am cooking at home, but in all honesty I didn't feel like paying the exorbitant pre-fixed amounts for Thanksgiving menus. That weekend we grabbed coffee and doughnuts at the Doughnut Plant in Chelsea. I was day dreaming about it prior to arriving in NYC. I told the nice guy who helped us out that he is adorable, at which he blushed and his colleague was smiling at my adorable characterization of him. Surprisingly enough, the vanilla bean which is called glazed doughnut elsewhere was my favorite. 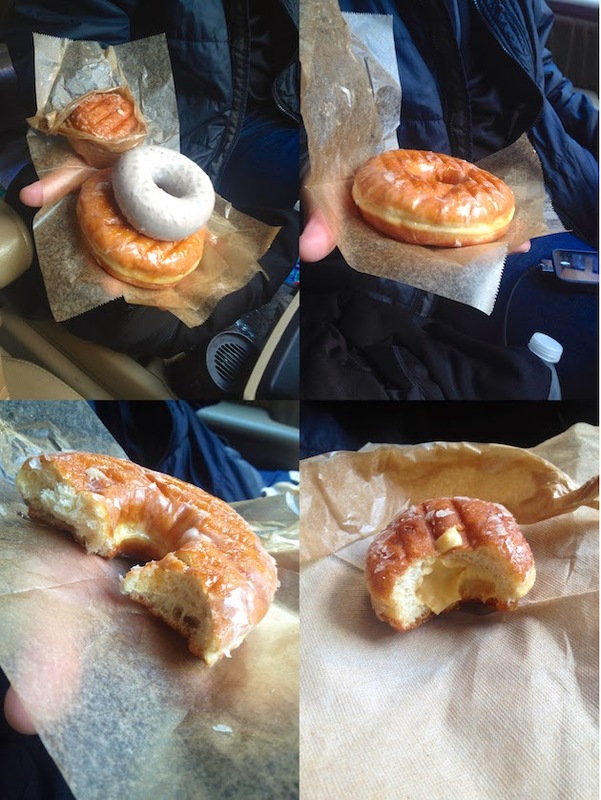 I loved it so much that I didn't care to explore any other doughnuts shops in NY. We also had the tress leches and creme brûlée ones which were just as delicious. Next time I hope to go with my friends The Noodle Queen and The Singing Chef and buy a variety of a dozen or so and go into a sugar coma sampling them all. This Behind the Scenes Saveur video didn't help ease my yearnings. That day we had Breads Bakery lunch and Russ and Daughters provisions for dinner. On Saturday we went on a food crawl with Jackie and Margaret. We landed again at Breads Bakery and off to the nearby hopping Union Square Greenmarket. We sampled through the Holiday Market that was featured for the holiday season. 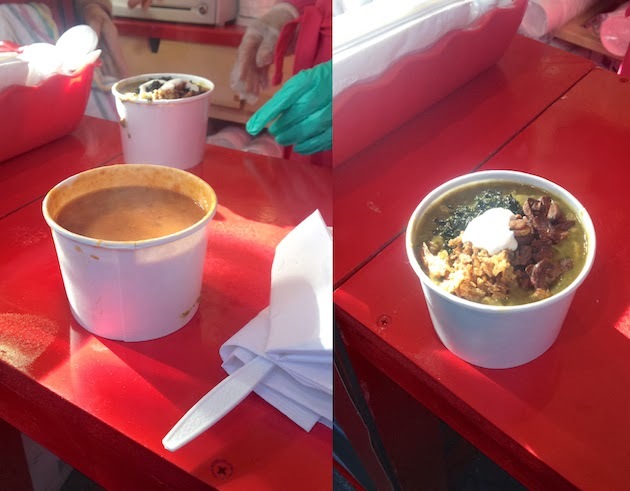 I loved the lubia bean soup, on left below, by Taste of Persia. From there, off we went to explore the newly opened Gotham West, on The Noodle Queen's recommendation and fell in-love with Ivan Ramen. We capped off at Lady M Confections at The Plaza Food Court with a slice of each matcha and vanilla crepe cakes. It was well worth the standing in line and the wait. Just in case you were wondering, yes, we did get a glimpse of The Macy's Thanksgiving Day Parade driving around at the tail end of the congestion. It was fun getting a glimpse of snoopy, batman and the rest of the cartoon characters and super heroes, floating in between the skyscrapers. More exciting was the night before, on a Wednesday, when we drove up to the upper west side where they inflated and parked the floats prior to the parade. I was giddy beyond words, but what made poor Wizard's Thanksgiving was a visit to Central Park. What great food! Everything looks mighty good. One of these days I will make it to that bakery! Looks insanely delicious. All of that food looks so, so good! ooo and I an jealous even if you only saw the tail end of The Macy's Thanksgiving Day Parade!! That pastrami sandwich looks incredible! My hubby would go nutso for the doughnuts. Looks like you made a great culinary tour of NYC! That bakery looks wonderful.